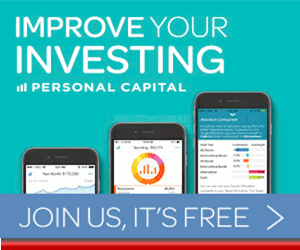 Freedom Debt Relief Reviews (Warning) | Is it a Scam? Legit? Safe? When you’ve got debt building up, finding a service to take care of it all for you sounds great. Freedom Debt Relief is one of the nation’s largest debt relief companies and has settled over $8 billion in debt since it’s been founded in 2002. But many people wonder, “Is Freedom Debt Relief legit or is Freedom Debt Relief a scam?” because it sounds too good to be true. If you do a search on “Freedom Debt Relief BBB” to look them up at the Better Business Bureau, you’ll see that they have an A- rating and 90% positive reviews. However, there’s also a mention of a Freedom Debt Relief class action lawsuit. So, what’s the story? Can you trust the Freedom Debt Relief program to help you get out of debt or will you be left with bad credit and owing even more money? 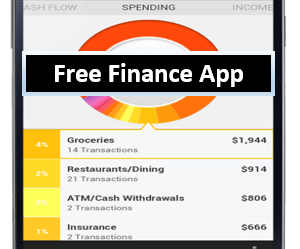 We’re going to dig into all of that in this Freedom Debt Relief review! AdvisoryHQ will help you find out what consumers say in their Freedom Debt Relief reviews, both good and bad, what those lawsuits are all about, and the honest truth about what you can expect from a debt reduction service. If you’re thinking of getting help from the Freedom Debt Relief program, this is a must read before you do anything. 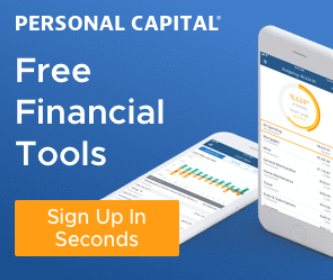 Let’s take a look at who is behind this San Mateo, California company that created the Freedom Debt Relief dashboard to help you get out of debt. Freedom Debt Relief, LLC is a wholly owned subsidiary of Freedom Financial Network, LLC and is run by Co-CEOs, Andrew Housser and Brad Stroh. The company has been around for over 15 years. In addition to running a Freedom Debt Relief program, they also provide FreedomPlus personal loans and offer mortgage education services. The company has been active in promoting consumer protection legislation and regulation at the state and federal levels. In 2009, Freedom Debt Relief was a contributor and supporter of legislation that passed to strengthen consumer protections in the industry. 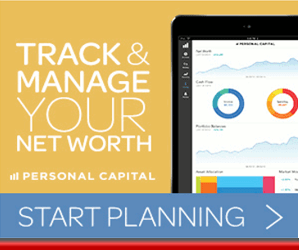 AdvisoryHQ Review | How Does Freedom Debt Relief Work? What many people look for when seeking out Freedom Debt Relief reviews is information on how the process actually works and how it’s going to affect their financial future. So, how does Freedom Debt Relief work? And how does freedom debt relief affect your credit? Can you trust the service? This is where you really need to understand what’s going to happen when you sign up with any debt relief company even before you search on Freedom Debt Relief reviews at BBB. For example, if you go in thinking they’re going to immediately settle with all your creditors and get them off your back, then you’ll be very disappointed. That’s not how it works. Here’s an overview of what you can expect once you sign up and sign into the Freedom Debt Relief dashboard. You do a free debt evaluation to see if they can help you. They’ll look at things like unsecured debt (they can’t help with secured debt like mortgages or car payments). They customize a program for you to make affordable monthly deposits into a dedicated savings account you control. Keeping this account separate from your other bank accounts increases the chance of success. They do not begin negotiating with your creditors until you have built up enough in the savings account to make a meaningful settlement offer. Once any settlement is reached with a creditor, Freedom will contact you for approval. Warning! This means that if you stop paying the debts that Freedom Debt Relief will be settling, your creditors may still contact you about payments, late fees and penalties can still be charged, and they can still take legal action. In the Freedom Debt Relief dashboard, you can keep track of your savings balance, which debts are being negotiated, and which have been settled. Once a debt has been settled, you’ll pay Freedom Debt Relief between 15% to 25% as their fee. 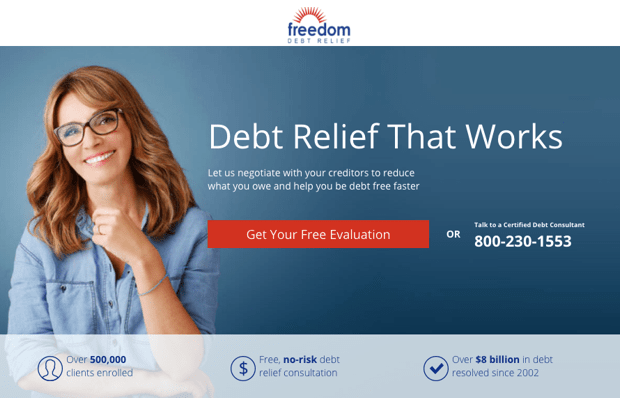 Freedom Debt Relief Reviews | How Long Does it Take and How Much Can You Save? While Freedom Debt Relief can’t promise anything because it’s dependent upon the negotiations with your creditors, they do say on their website that you could save 15-35% and resolve debt within 24-48 months. 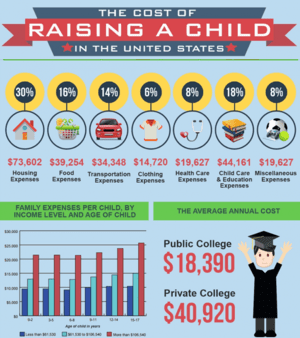 As an example in their savings estimator, if you live in California and have $25,000 in debt to settle, the monthly payment would be $396 and the pay-off would be in 46 months. Related: DriveTime Reviews: Is it Legit? A Scam or the Best Car Shopping Dealer? 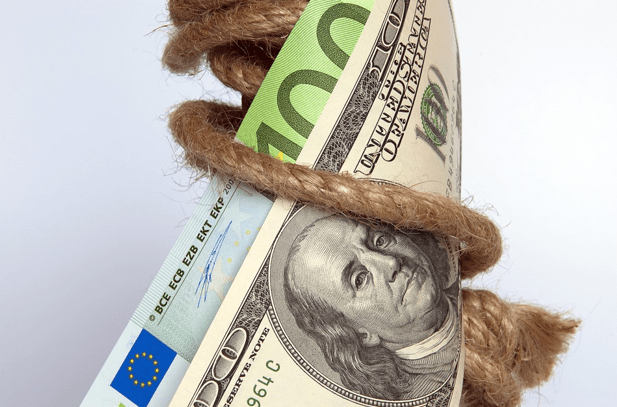 How Does Freedom Debt Relief Affect Your Credit? If you stop paying your debts and turn them over for debt relief, it will hurt your credit. Even those that write positive Freedom Debt Relief reviews at BBB and other sites note that your credit is going to take a hit. While some may get impatient and think Freedom Debt Relief lies when they say they’ll negotiate, they make it clear that they don’t even begin negotiating until you’ve built up enough in your dedicated savings account. They can’t negotiate with multiple creditors at once if there is not enough money there to make a meaningful settlement offer. You can keep up with who they’re negotiating with now and who is next in the Freedom Debt Relief dashboard. So, you may only want to do this as a last resort if you simply cannot keep up with the bills, because rebuilding the damage to your credit from stopping payments on your bills can take years. What about that Freedom Debt Relief Class Action Lawsuit? When you’re searching “Freedom Debt Relief BBB” or “Freedom Debt Relief complaints,” you’re going to run across mention of some lawsuits against the company. 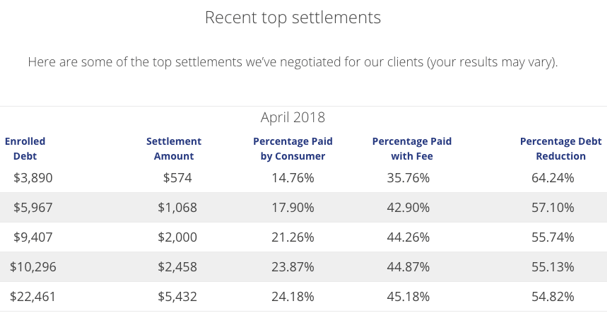 There has been more than one Freedom Debt Relief class action lawsuit where consumers felt they were the victims of Freedom Debt Relief lies about their credit being ruined or the fees that would be paid after settlement. Back in 2011, the company paid almost $2 million in settlements to consumers and in 2017, the Consumer Financial Protection Bureau filed a lawsuit claiming dishonest business practices. But despite the Freedom Debt Relief class action lawsuits, online reviews are overwhelmingly positive, as we’ll see next. 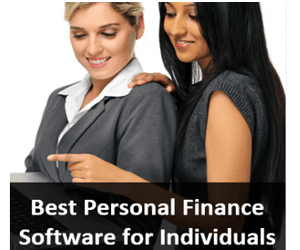 Freedom Debt Relief Reviews | What are People Saying? When looking over Freedom Debt Relief reviews there’s a noticeable number of happy customers that don’t think Freedom Debt Relief lies and are thankful for the company’s help. Next, let’s see what consumers say in their Freedom Debt Relief reviews. Among the Freedom Debt Relief reviews at BBB, one person said they were skeptical at first wondering, “Is Freedom Debt Relief legit?”, and they were very pleased with the results. A Freedom Debt Relief review at Trustpilot said working with the company was a great experience, they just wished it didn’t tank their credit rating. A Freedom Debt review at ConsumerAffairs gave kudos to their customer support representative that helped them through a difficult financial time. Another positive Freedom debt relief review at BBB said the company did exactly what they said they would and even handled things when two credit card companies tried to sue. A negative Freedom Debt review at BBB said the amount they ended up saving overall once debts were paid was not what they expected. If asked, “Is there a Freedom Debt Relief scam?” they’d say yes when it comes to your credit score. A both happy and unhappy customer said in their Freedom Debt Relief review that they were thrilled to get their debt paid off, but weren’t happy with the customer support. A negative Freedom Debt Relief BBB review didn’t like that they changed the contact information with their creditors and said not all companies will negotiate with them. Read More: TeenSafe Reviews: The Truth About TeenSafe | Is it Effective? Worth It? Safe? Ultimately, is Freedom Debt Relief legit or is Freedom Debt Relief a scam? We found that the company is legitimate, but haven’t always been upfront about their program, the cost, and the impact on credit ratings. Many Freedom Debt Relief complaints have to do with the drop in their credit score due to the bills remaining unpaid until negotiation and settlement. We saw that the company does clearly address this in their website FAQ answering, “How does Freedom Debt Relief affect your credit?” and is clear about the process. We can’t overlook the importance of the overwhelmingly positive Freedom Debt Relief reviews on many sites, which shows they must be doing something right to have so many happy clients. If you feel you need to look into this type of debt resolution, the Freedom Debt Relief program is one of the best reviewed out there. Just be sure to understand going in how it works, so you won’t be unpleasantly surprised with the impact it may have on your credit.